Loi Krathong 2548 (Buddhist calendar) was a big splash, especially as it fell on my birthday this year. This was my first Krathong festival and it is definitely one of those sights that, if you’re planning on going to Thailand, you should schedule your trip around. 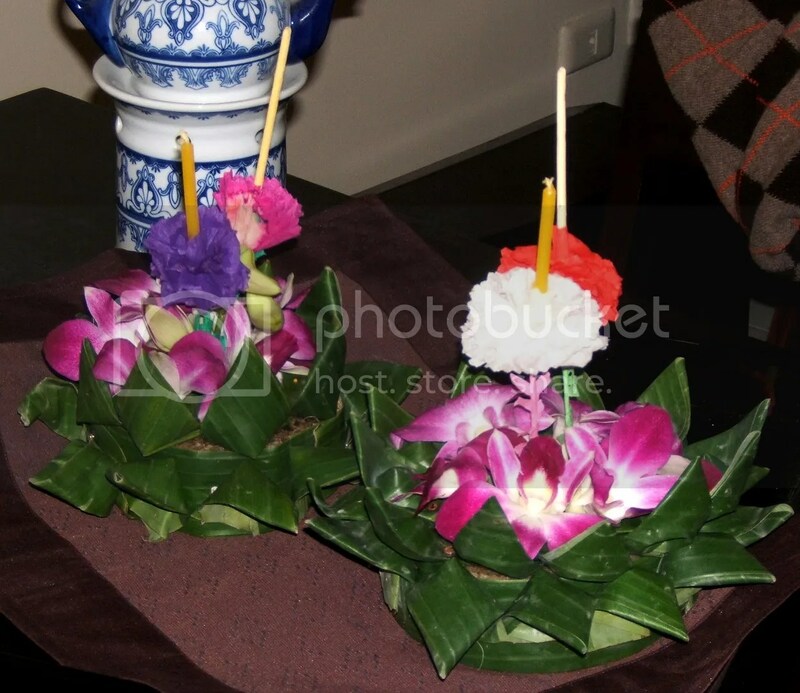 My previous blog entry provides a link and some more details about the festival, but something I can add is that I read on 2Bangkok is that Loi Krathong was originally a festival in just the northern provinces of Thailand. Sometime in the past twenty five years of so, the Tourism Authority of Thailand appropriated the festival and encouraged it as a more widespread event. Don’t know if this is true or not, but it would be interesting. 2Bangkok has some good photos of the event, along with photos from 2004 and 2004 (or, if you prefer, 2547 and 2546). Above – our two Krathong. We received these at the Metro Mall (small underground shopping area at our local Metro station) for each spending more than 50 baht. Basically, buy a smoothie, get a Krathong. Not bad for US$1.25. Above right – after years of environmental degradation caused by literally hundreds of thousands of Krathong made of foam and other non-biodegradable materials clogging the rivers, canals and waterways of the Kingdom, the government started a campaign a few years ago to encourage (and eventually mandated!) the use of environmentally-friendly materials. 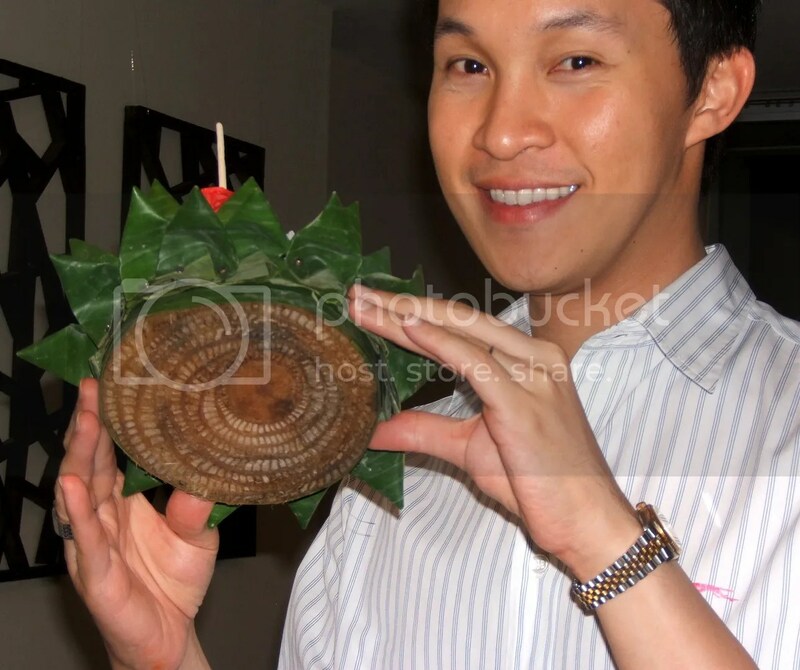 Tawn shows that our Krathong are made from a slice of palm trunk. They are further decorated with banana leaves, flowers, incense, and candles. Some can be quite elaborate. For dinner we walked to Sukhumvit Soi 12, about 15 minutes from the house and hiked far back into the soi (alley) to Crepes & Company. This is a widely known “family” restaurant that serves, obviously, crepes as well as a wide variety of Mediterranean foods. Every few months they set up a special menu featuring the cuisine of a particular country. Right now it is Morocco, so we had a lovely red snapper tajine – sort of a clay pot stew. We also enjoyed a Massaman curry chicken crepe and a nice salad with eggplant, roasted red peppers and olives served on leaf lettuce. With the dinner we had a For desert we had a wonderful Australian Cab-Shiraz-Malbec blend that complemented everything nicely. For dessert we had fried almond and honey pastries that were similar to baklava except that instead of using filo dough they actually had a pastry crust. Then I was surprised by the arrival of pancakes (not crepes – pancakes!) with bananas, chocolate sauce, whipped cream, two scoops of ice cream, and a birthday candle! After dinner we took a cab to Chulalongkorn University – where Tawn received his Bachelor’s Degree in Political Science. 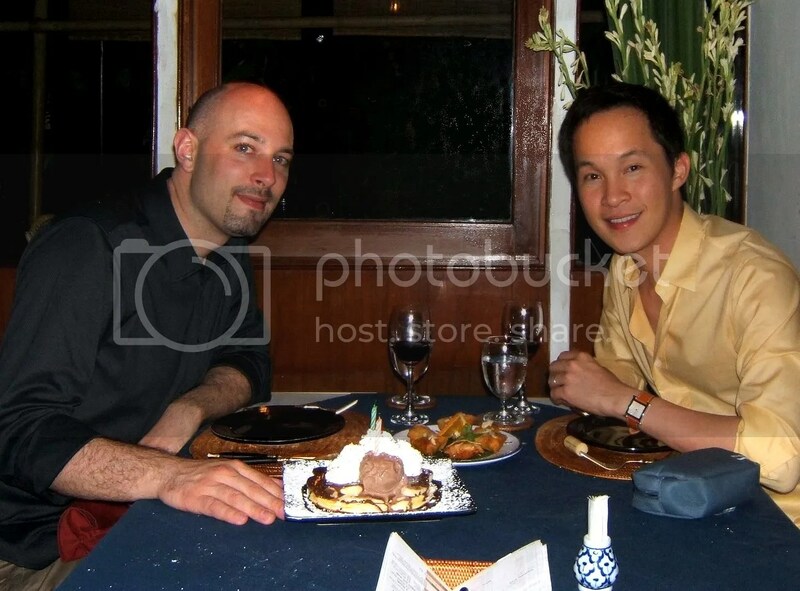 “Chula,” as it is affectionately known, is the Harvard, Princeton, Stanford and Yale of Thailand. It is not the Berkeley of Thailand. That honor (notoriety?) is bestowed on crosstown rival Thammasat University where the student riots of October 6, 1976 occurred.. There were literally tens of thousands of students and other young people gathered on the campus for the festivities. It was a bit of a cross between homecoming and a religious event. 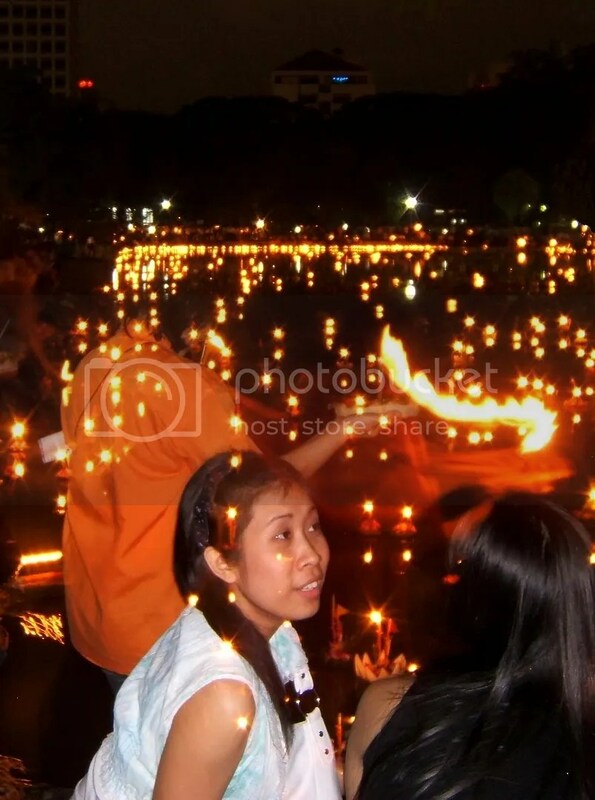 Every faculty (school) at the university had an entry in the “best Krathong” competition, performed a staged event along a set theme including floats and costumes, and most groups also had food or beverage booths set up as fund-raisers. Everyone made a stop by the lagoon, which is next to the marching field and the huge statue of King Rama IV and King Rama V. The university was named after King Rama V. The lagoon is perhaps two or three acres in size and already there were thousands or Krathong floating in it. It had rained while we were at dinner, so the air was cooler but spirits were not dampened at all. We took our Krathong from their bags and prepared them. First, we placed a coin on each for charity. 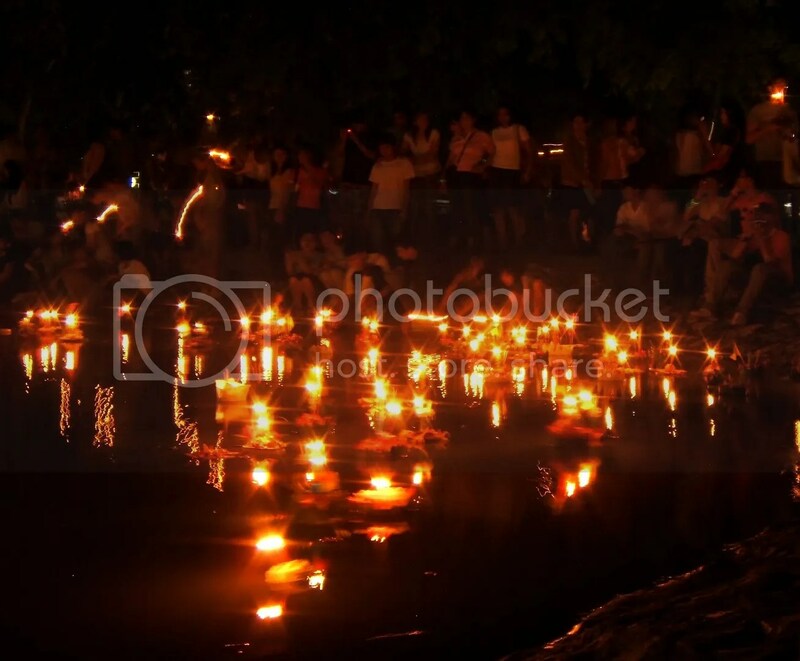 Later on, the coins would be collected from all the Krathong and donated to various social service groups. Then, we plucked a hair and put it on the Krathong, so that a part of us would go with it. Walking the water’s edge (Tawn being especially careful not to slip in since he was wearing stylish sandals) and lit the candles and incense. All around use were hundreds of other people doing the same thing. Finally, we said a short blessing, thanking nature for its bounty and asking for good fortune in the season to come. 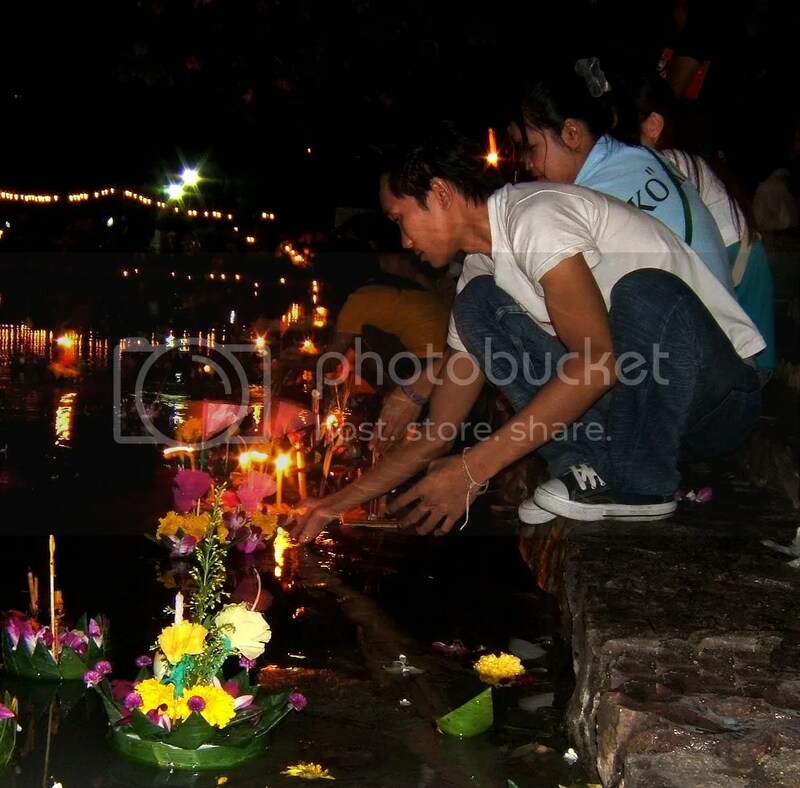 Then we set our Krathong into the water. Since there was no current, a little light splashing helped get them on their way. One important part of the customs surrounding the festival is that couples are supposed to launch their Krathong at the same time. It the rafts follow and bump into each other, that is an auspicious sign for the relationship. This is supposed to be especially true if you launch the Krathong at Chula – but that may be since it is a lagoon the odds of them bumping into each other increase! From there we took a taxi home and called it a night, thoroughly exhausted after all our walking and excitement. Plus, I started my Thai language classes this morning at 8:00 and needed all the sleep I could get. More about that tomorrow. This entry was posted in Expat Life, Thailand and tagged Buddhism, Buddhist, culture, Holiday, Loi Khrathong, Loy Khrathong, Thailand by christao408. Bookmark the permalink.